Today I want to bring up something that I discuss often, but I’m not sure that I ever explained clearly in a blog post. 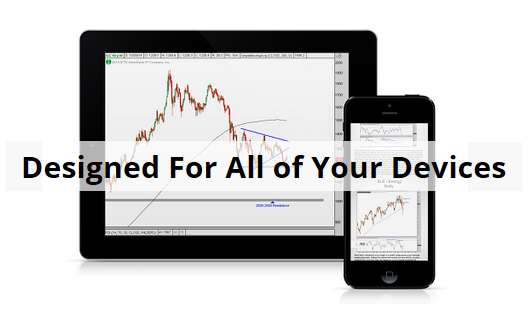 Long-time readers know that I only use a handful of tools as a supplement to price action. I want to reiterate “supplement”, because price is the most important indicator we have, it’s the only one that we can actually trust, and the rest are there simply to add confirmation or help dissuade us away from our thesis. The 200 day moving average is one that is mentioned a ton throughout the financial media and twitterspheres of the world, but is often misinterpreted for whatever the reason. Usually the 200 day is referring to the 200 Day Simple Moving Average, which calculates the average closing price over the prior 200 trading days. Each day, the trading session from 200 days ago gets removed from the calculation and the new day which just ended gets added. With each day comes a new plot though time, which is why it appears as though it is moving. Contrary to popular belief, there is no support or resistance history at this average. This is an invisible line as far as supply and demand is concerned. 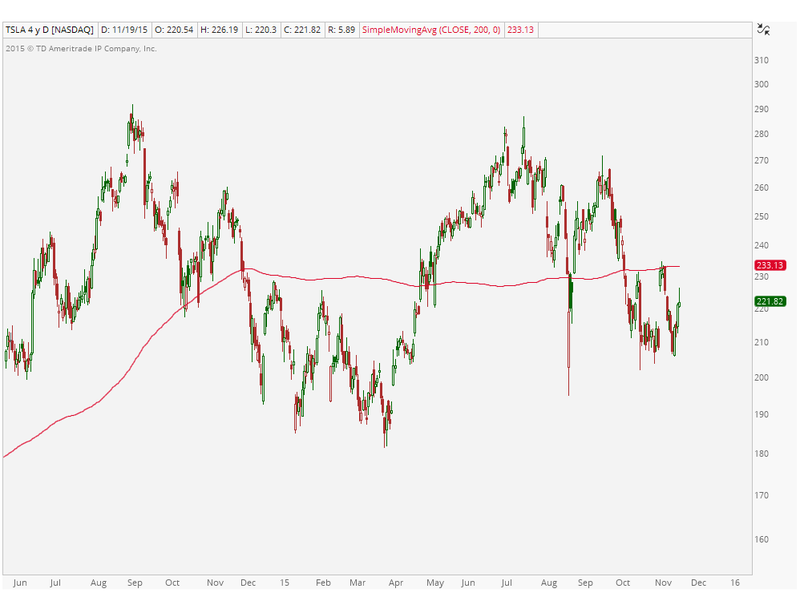 So when you hear, “$XYZ just crossed below its 200 day moving average”, that doesn’t mean anything at all on its own. It makes for a nice soundbite and fills airtime, but for a market participant, this is the equivalent of them telling you that $XYZ just changed it’s ticker to $STFU. It’s meaningless. What we really want to observe is the slope of this smoothing mechanism. Is price above an upward sloping 200 day? Or is price below a downward sloping 200 day? That’s much more valuable information. We use this moving average primarily to help identify the trend, or in some cases, a lack thereof. 200 trading days represents about 9 months of data. So you’re essentially looking at the average daily closing price from the past 3 quarters. This is enough to data to get an idea of the direction of the intermediate-term trend, which is the timeframe I personally choose to live in. I look out weeks and months so the 200 day helps me with that. But even if you have a shorter or even a longer-term time horizon than I do, I think this one simple lesson can help (This can also be implemented in weekly timeframes for longer-term investors using a 200 week simple moving average). If you are looking for mean reversion trades, then yes when prices get a little ahead of themselves away from a flat 200 day moving average, expect a reversion to the mean, not a new trend. The bigger point I’m trying to make here, however, is that when prices are anywhere near a flat 200 day, that’s one we want to stay clear from – long or short. This is when the biggest headaches are created. I learned this lesson the hard way after many years of ignoring something this simple. Go back and see for yourself. I’d bet that there were trades you made in the past where prices were near a flat 200 day moving average and it did not work out in your favor, or worse, you got stopped out and then it continued in the direction you had hoped for before. This is the type of activity you should expect from an environment like this. Isn’t it better to just stay away and save yourself the aggravation? I’ve been fortunate to learn a lot of lessons from my predecessors. Sitting through meetings put on by the Market Technicians Association, watching YouTube Videos created by traders, reading blog posts or watching interviews by technicians I respect have all helped me develop my own approach. 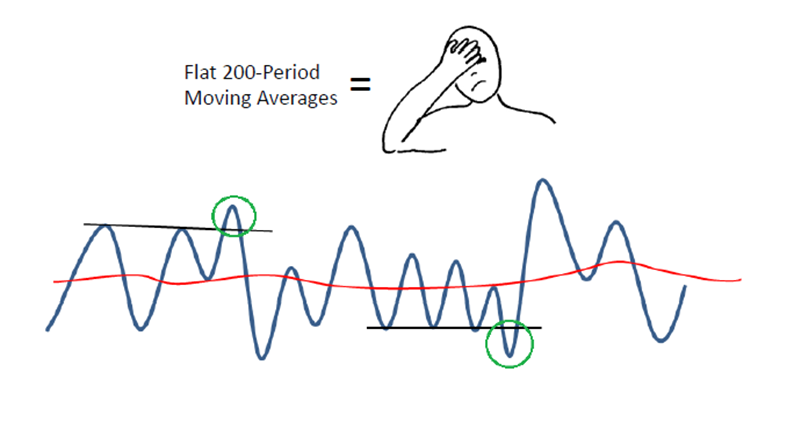 But this one, the “stay away when price is near a flat 200 day”, is one I had to learn on my own. This was part of the “tuition” that I paid to learn that lesson. Successful traders will often tell you that when you first start to learn this business and lose money early on, that’s the tuition you pay and those losses/lessons will always help you in the future. I’ve pointed this out to younger traders in the past and they’ve unanimously all thanked me eventually. This is one I firmly believe in. The worst case scenario is that you miss out on a trade, big deal. The best case scenario is that you save yourself from a ton of headaches. The whipsaw sort of action you get is characteristic of this type of environment and not one that I want to participate in long or short. Click Here for full access to my research. Feel free to look through our different packages. There’s a weekly research report here for everyone depending on your goals and approach to the market.